Just an end of week update! I've just spent the last 15 minutes re-doing my blog list as I single handedly managed to delete all the blogs on it which REALLY annoyed me but I think they're all back on it! I haven't been doing much this week, I had my AS exams in French and Psychology on Wednesday and half way through the day it started snowing lightly again so every single bus company cancelled all buses...fun times! Then my school panicked about ice on the roads on Thursday so I had a snow day (more like a grey slush day though), and by Friday the snow miraculously melted over night; but apparently now there's going to be another snow 'dump' on Wednesday so its all crazy here! I've decided to change the blog slightly to accomodate bigger photos, and I should be able to do the Strapya giveaway when my package arrives (I'm still waiting); and also I ordered some of Lady GaGa's heartbeats in red/pink which I am soo excited about as I'm a big fan and apparently they're incredible! 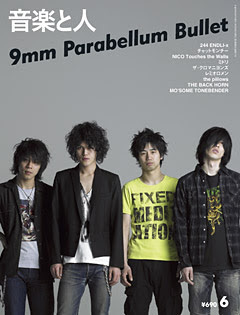 I'm also getting back into listening to J-rock and J-pop and I found this awesome band called 9mm parameter bullet when browsing Itunes J-music section, the lead singers hair is amazing! Lastly, I spent the weekend at my friend's house and we came across this clip from Mock the Week where Hugh Dennis voices over a piece of news footage and this one of Boris Johnson and David Cameron made me laugh so much! I tagged your blog in a post, check it out if you have time! I heard about these earphones but didn't know what they looked like. They're cool! Also, I love me a bit of J-pop/rock. The last J-rock band I really liked was UVERworld. Some of their tracks are pretty good!